Cricket Ireland would like to highlight an upcoming Sport Ireland-sponsored webinar that is aimed at parents, carers, volunteers, clubs, coaches and child welfare officers. 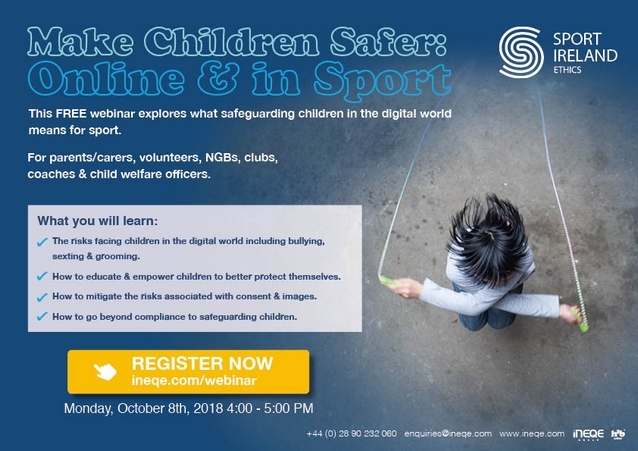 The session will be run by Jim Gamble QPM who is a former Chief Police Officer and was the founding Chief Executive of the Child Exploitation and Online Protection Centre (CEOP). The webinar will be live from 4pm-5pm, Monday 8 October 2018. • The risks facing children in the digital world including bullying, sexting and grooming. • How to educate and empower children to better protect themselves. • How to mitigate the risks associated with consent and images. • How to go beyond compliance to safeguarding children.